It’s no coincidence that today’s Gospel is the same as the daytime Mass on Christmas Day. Tomorrow the Christmas octave concludes and a new year begins, but it begins by honoring Mary as the Mother of God. Today is the end of the year; in the Book of Revelation Our Lord identifies himself as the Alpha and the Omega, the beginning and the ending (see Revelation 1:8; 21:6,13), so in contemplating the last day of the year in the light of the prologue of the Gospel of John we are taking stock of the year ending and drawing up resolutions for the year beginning. If we read today’s Gospel carefully we see that John is not just speaking of one moment that comes and goes, but of Someone around whom everything revolves: the Word, who enables us to become children of God and brings us the fullness of grace and truth. Therefore we contemplate the ending and the beginning of the year in his light. There are two spirits at play in celebrating the ending and beginning of the year. One is squeezing out the last few hours of the year in the best party you can find (or devise) and go howling and cheering from one year to the next. It’s an effort that can’t be sustained very long and usually doesn’t last past the hangover on the morning of January 1st. The Christian spirit of this day, on the other hand, doesn’t shy away from making it a moment of celebration, but also sees the importance of taking stock of all the blessings received during the year and giving thanks to God for them, as well as showing gratitude for his mercy regarding those moments we regret. It is a good moment to ask before the party whether the year began with Christ (Alpha) and ended with him (Omega), or whether at some moment we “broke orbit” around the Word and started to veer off into the unknown. In today’s First Reading John reminds us that the “antichrists” apparently started with Christ, but ended up against him. We pray that we’re not one of them, but we must also pray to identify them so that they don’t knock us off orbit too. Let’s thank Our Lord today for all the blessings of this year about to conclude and for his mercy over anything this year we regret. Let’s pray that in the new year we continue to place him at the center of our lives and make his Word resound. Readings: 1 John 2:18–21; Psalm 96:1–2, 11–13; John 1:1–18. See also Christmas Day. Today’s Gospel reminds us that when it comes to prayer and a healthy spiritual life there’s no such thing as being past your prime. Anna’s married life was short; she spent more of her life as a widow than as a wife, but all those years were full of prayer. As Luke recalls she was a prophetess: she had a special relationship with the Holy Spirit. In the early Church, as the New Testament attests, widows didn’t just receive material support from the Church: they provided invaluable spiritual support. The elderly have a great vocation to prayer and to sharing their wisdom. Anna spent many years in prayer and expectation, but when the moment came, she didn’t shy away from giving witness as well. She was attentive to the signs of the times, helped by the Holy Spirit, and she saw that the time of redemption was at hand. Just as Simeon yesterday rejoiced at the sight of the Christ, Anna wants to spread the good news that the Messiah has come. You’re never too young nor too old for a life of prayer and a mission of giving witness to Christ. As the year draws to a close, spend some quiet time with Our Lord to see how you can draw closer to him in prayer and give witness to him. Readings: 1 John 2:12–17; Psalm 96:7–10; Luke 2:36–40. Today’s Gospel reminds us that the Holy Spirit didn’t just come onto the scene at Pentecost. The Spirit has been intimately involved in the work of salvation from the beginning. Simeon, at the prompting of the Spirit, is about to meet someone for whom he’s been waiting his whole life. He didn’t know when, he didn’t know how, but when the moment came the Holy Spirit led him to the baby Jesus in the Temple and revealed Jesus to be the Christ. Simeon didn’t just rejoice for his own sake at finally meeting the Messiah, but for all of Israel that had been waiting for him. Everyone talks about meeting that special someone, but actually, beyond a spouse, we all have a special someone we need to meet and love: Our Lord. We’ve already met him sacramentally through baptism and while we live a life of grace he is always with us. The Spirit also dwells within and will lead us by the hand if we allow it to experience Our Lord in our hearts and know him better in order to love him completely, just as he loves us. It’s an awareness of being loved that spurs us to love in return and rejoice at being loved. Simeon had to wait his whole life, but we don’t. Ask the Spirit to help you experience Our Lord more deeply as that special someone who will change your life for the better. Readings: 1 John 2:3–11; Psalm 96:1–3, 5b–6; Luke 2:22–35. Today’s Gospel recalls that when Herod received word that the prophecies regarding the Messiah were starting to be fulfilled he saw it as nothing other than a threat to his leadership. In his twisted obsession with power he thought a toddler was a threat to his reign. Little did he know that he wouldn’t even live long enough to know the Messiah as a a grown up. Today the Church remembers those little children who were a victim of Herod’s “profiling” to ensure his power. The Church believes that even when someone unbaptized dies for Christ, their shed blood “baptizes” them. 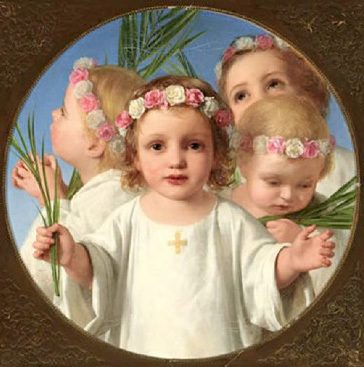 The Holy Innocents are remembered as martyrs for having shed their blood for Christ. Even though they’d never known him in their short lives, they died for him and came to know him in eternity when his earthly mission was complete. We remember the Holy Innocents during the Christmas octave because their witness came during Jesus’ childhood, but the suffering of these innocents reminds us of so much suffering by innocent children in the world today: abortion, abuse, child soldiers, trafficking, and so many other forms of exploitation. The Herods of today are ideologues, exploiters preying on the weak, or simply those who see children as a threat to their autonomy, lifestyle, or well being. We must pray children at risk, but also work so that every child is safe, protected, and cherished. Let’s ask the Holy Innocents to intercede today for all children in danger and at risk, but also to pray that those responsible change their ways and seek forgiveness for what they’ve done. Readings: 1 John 1:5–2:2; Psalm 124:2–5, 7c–8; Matthew 2:13–18. In today’s Gospel, after Mary and Joseph spent days searching for Jesus, only to find him in his “Father’s house”, what they don’t say to each other speaks volumes. Mary doesn’t say, “not another word out of you young man, get on that camel right now.” Joseph doesn’t say, “you are going to be sweeping the wood shop until the broom breaks.” Jesus doesn’t say, “I am twelve years old, and I happen to be the Son of God, so you just take care of the house and the wood shop and I’ll save the world, okay?” They didn’t understand completely why Jesus did what he did, but they loved and accepted it, and Mary guarded all these things in her heart. Jesus counted on them to understand and accept him, just like every good family does. We all take our family for granted. “For granted” doesn’t mean we don’t appreciate them and show gratitude for all they’ve done, and are for us. A family is a gift, and our family is our family no matter what they do or don’t do on our behalf. We feel that all too well when we don’t respond to the love shown us by our family, or when we lose a member of our family unexpectedly and see what a hole that leaves in our life. We count on our family, and that reliance on our family reflects the reliance we should have on God. When we can’t count on our family, it’s hard for us to count on anything else, even God. We all know of truly tragic and heart-breaking family situations – divorce, children lost to drugs, squabbles over inheritances, misunderstandings, even betrayals – but even in those situations we don’t lose sight of the ideal which Sirach reminds us of in the First Reading: a father and mother set in honor and authority over their children, children revering and praying for their parents, obeying them and caring for them when they grow old, and the blessings God showers on children who do so. This model of mutual respect, help, and reliance is meant to be reflected in our society as well, so when it’s not lived in the family it’s no surprise that society suffers as a result. Our family is more than what they do or don’t do for us, and more than what they mean or don’t mean to us: they are our family. God’s given them to us. The family God’s given us as a gift is the bedrock of love on which we build our love. 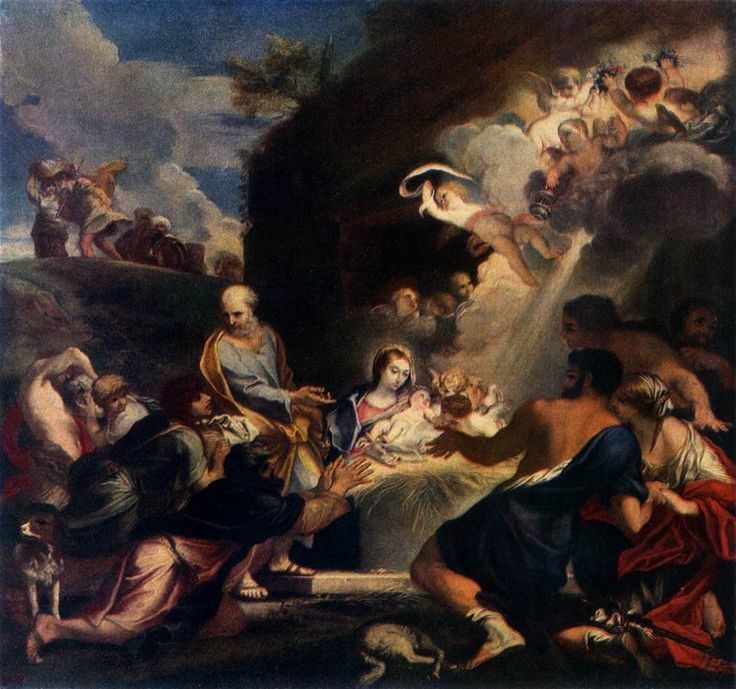 Sunday in the octave of Christmas is about the Holy Family. Our Lord is telling us today that family is more than just something to take for granted. Our family ties, be they biological or adoptive, are the bedrock for love. They’re more than a simple hereditary or social obligation. We build on them by loving and being loved in return, and sometimes even loving when we’re not loved in return. Christ reveals God to us as Father. Not just as his Father, but as wanting to be Our Father as well. When we realize that we are chosen by God the Father as his adopted children, and as his creation, we see how a holy family should be, as St. Paul reminds us in the Second Reading: holy and beloved. We’re made holy by sharing in the life of God, through our Baptism, and we are beloved because we have received the gift of life itself, no strings attached. We build our love on that bedrock of divine love by bearing with one another and forgiving each other when grievances come, just as the Lord has forgiven us for all those times we haven’t shown him the love he deserved. With a spirit of gratitude to God for the gift of life and the gift of his son we serve and love each other in our family, avoiding bitterness and provocations and disobedience. “Obedience” grates on ears today, in a world that’s so obsessed with autonomy and self-reliance, but in a family it means acknowledging the gift God has given us of someone we can rely on. We show gratitude by obeying, and it reminds us that being someone relied on can be a big sacrifice and responsibility as well. Finally, we can’t forgot those who’d categorize their family experiences as more of a trauma than what we’ve considered today. God calls our loved ones to love, and sometimes they don’t respond to that call. It’s the mystery of human freedom and sin. He calls us to love as well, and when we consider Christ’s example we know our love can’t be tarnished by a lack of love from others. Don’t feel left out in the cold: the Holy Family always has room for you, and the Church is always praying for you. The bedrock of love is always there, and forgiveness, even when a loved one doesn’t show it, is the balm that will bring you peace and consolation. Don’t be afraid to say “I forgive,” and don’t be afraid to say “I’m sorry” either. It’s often the trigger for many people rediscovering that the bedrock of love on which their lives are built is not buried that deep after all. It doesn’t mean that you’ll forget, and many times it doesn’t mean that what happened will hurt any less, but it will give you a peace that the world can’t give. Let’s pray today that families be united in love, like the Holy Family, that those separated by misunderstandings and squabbles may find reconciliation, and that the whole Christian family may be re-united to God the Father through his son. Readings: Sirach 3:2–6, 12–14; Psalm 84:2–3, 5–6, 9–10; Colossians 3:12–21; Luke 2:41–52.